I have been testing various types of couplers for use on my Bronx Terminal layout, trying to find a good mix of appearance and performance. The uber tight radiuses on this layout really tax couplers. Until now I have always used Kadee #5’s or #58’s on all my equipment. 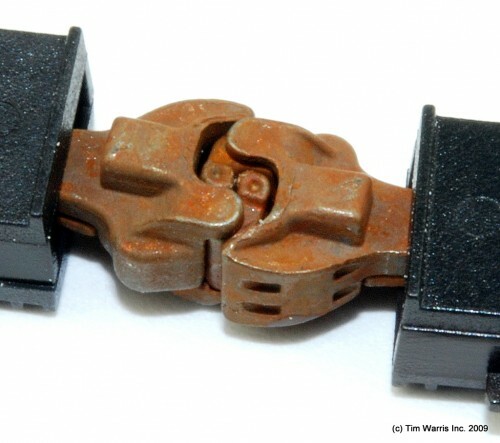 They work very reliably and look ok. On the tight curves of the terminal the self centreing action of Kadee couplers can be a bit of a hindrance. In order to couple reliably, some handling has to be done, I can live with that if I have to. I figure if I have to handle the couplers anyway, perhaps I should look into some other options. One alternative is to use truck mounted couplers. Truck mounted couplers will always be lined up relative to the trackwork. I am not too concerned about how well this would perform, as long as trucks are free rolling, pivot properly and the cars are weighted properly they work fine. 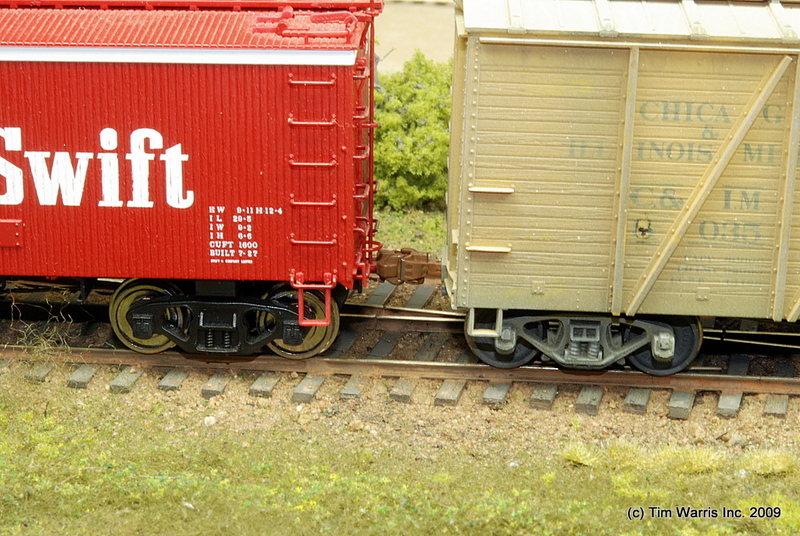 Most equipment in N scale has truck mounted couplers and the equipment does not suffer from it. However, replacing all the trucks on the cars would be quite an investment, so I would rather not have to do that. 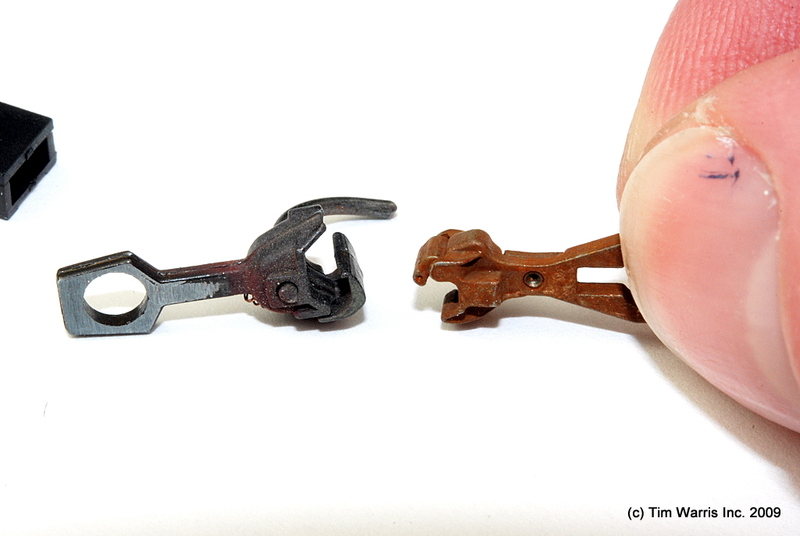 I decided to take a closer look a Sergent Engineering Couplers, so a couple weeks back I ordered a sample of the two types they offer, EN87A narrow shank, which come pre-assembled in a draft box and some EC87A with compatible shank, also pre-assembled. The EC87A are a drop in Kadee replacement while the EN87A are designed to be mounted to the car. There is no question that these couplers look great. They are scale, and noticeably smaller than Kadee couplers. 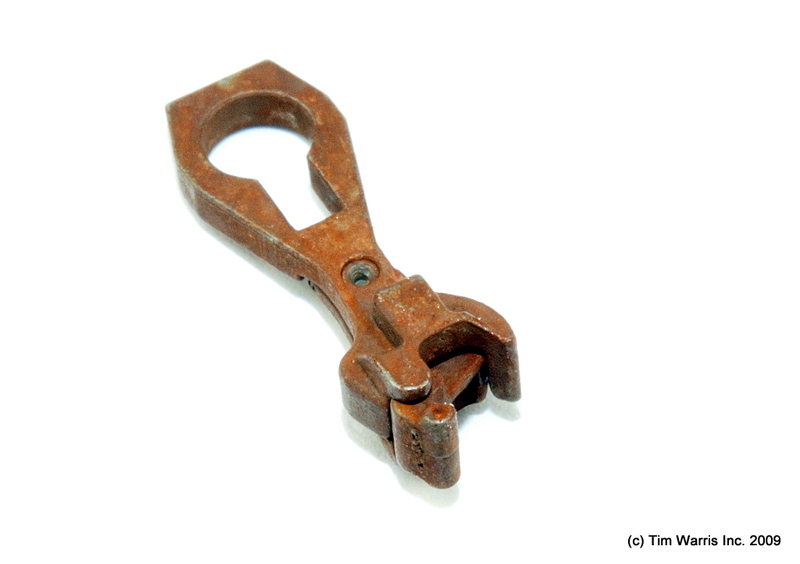 But they are also completely incompatible with Kadee couplers, so its an all or nothing decision to use them. But geez, look at them. They look fantastic. Mounted on a couple of cars they look even better. So we’ve established that the look great, but how well do they work? To uncouple the cars, a magnetic uncoupling wand is used. On the end of the wand is a small magnet that is simply touched to the top of the coupler releasing the knuckle and opening the coupler. I forgot to order one of these! Fortunately I was able to improvise by using a small rare earth magnet attached to the end of an Allen wrench. 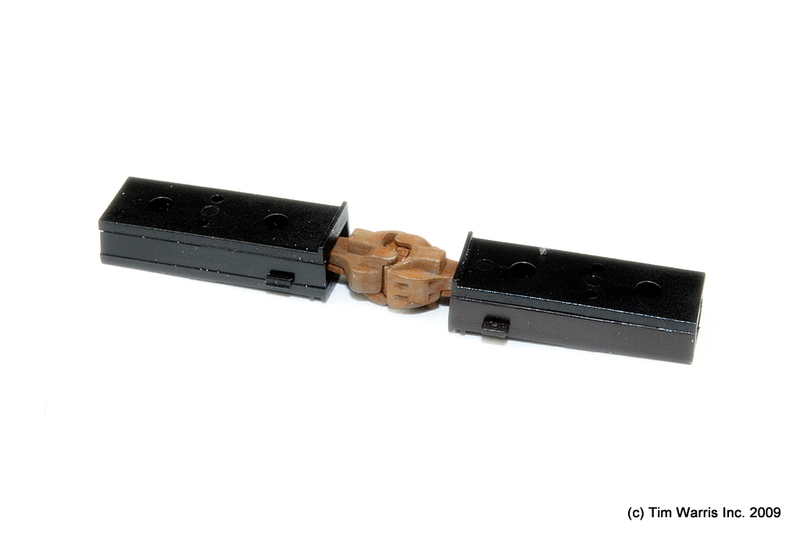 While not as functional as the uncoupling wand from Sergent, it works well enough to test the couplers. 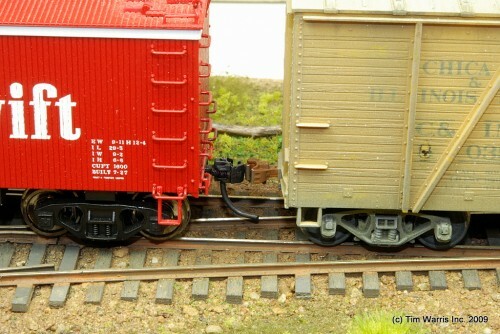 The Sergent version also includes a small hook to open a closed coupler should it get closed after uncoupling from another car. One trouble area I find is that they can occasionally be hard to get to reliably couple. Seems that a bit more force than normal is required to get the knuckles to stay closed. I have found that polishing off some of the rust finish with a rotary tool helps quite a bit, but still they can be occasionally hard to close. Not sure how irritating I would find that. I have shot a few videos showing them in action. Watch them in HQ if you have a fast connection, it will look better. Sergent couplers in action. They couple in a manner similar to the prototype. Only one knuckle has to be opened to couple. Taking a couple of couplers for a spin. They work well and look great! From the preliminary tests I have done so far I really like these. Since I only have a fleet of about 35 cars so far changing them all over isn’t a big issue. One concern is whether or not I can successfully mount one on my CNJ 1000 Brass Loco. Mounting a Kadee to this engine was a challenge, not sure if I can change it over or not. That will likely be the deciding factor whether or not I settle on these. Apparently couplers are a passionate subject. 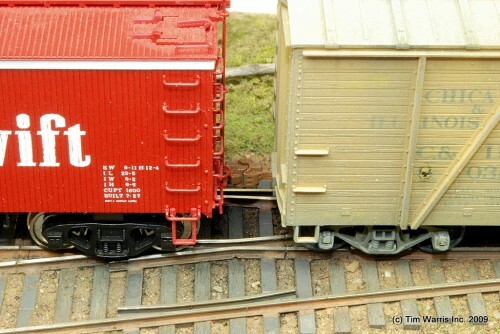 A recent thread about Sergent couplers on the Model Railroader forum was locked as, like always, opinions got the best of people. 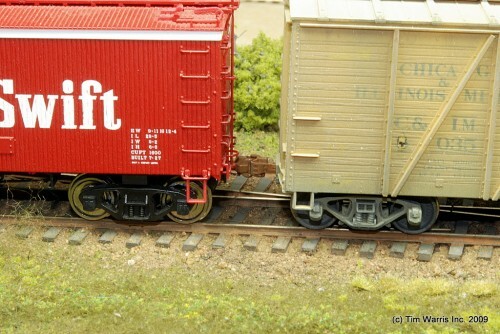 That said, I would love to hear from modelers who have actually used these in a serious way.